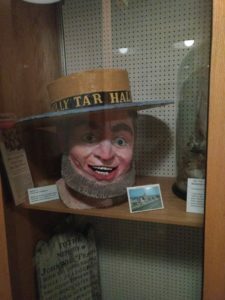 In January, I spent some time in Halifax, Nova Scotia and was lucky enough to be able to visit two of the City’s museums. 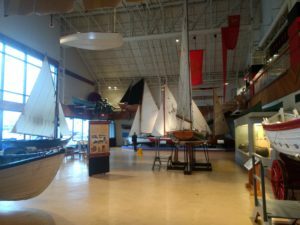 On my first day there, I was able to visit the Maritime Museum of the Atlantic, which is in central Halifax on the waterfront. The museum is only a few steps from the Halifax ferry terminal, as well as many of the city’s bus routes. 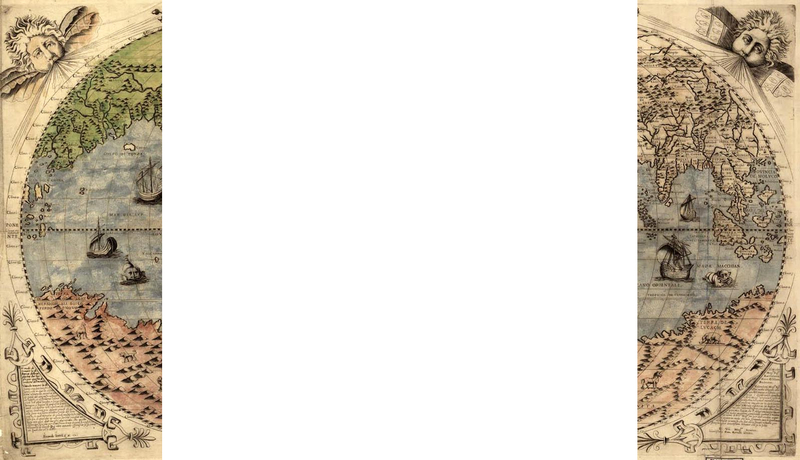 There is a real dearth of maritime museums in Canada. The Toronto Maritime Museum closed in 2008, and the excellent Maritime Museum of the Great Lakes was closed to the public in 2016. There is simply not the government support for a maritime museum on the scale of the National Maritime Museum in Greenwich. The Maritime Museum of the Atlantic does not try to be the NMM, it is much more on the scale of something like the National Museum of the Royal Navy in Portsmouth, United Kingdom. Like the NMRN, the MMA uses a repurposed waterfront building. It also includes a pier and the CSS Acadia, the only ship to serve Canadian naval forces in both the First and Second World Wars. The last time I visited the Maritime Museum of the Atlantic was in 2010, and I have to admit that I wasn’t impressed with it then. I have learned a great deal about museums since then and I was very much impressed this time. Over all, the museum does an excellent job of covering it’s bases. The structure and organization of the building has certainly be very well considered. Much of the ground floor is dedicated to a large hall, where various small boats are displayed, with a view of the Acadia through the large windows. Much of the rest of the ground floor, towards the front of the museum, is dedicated to the Royal Canadian Navy. However, I was drawn upstairs, to a half-floor where there were a number of dedicated displays. The first thing you come to at the top of the stairs are mass of ship models. It’s a collection of ship models that the National Maritime Museum or the Art Gallery of Ontario would envy. The majority of the of the models are from the steam age, but are all incredibly detailed. Space is provided for you to be able to walk all around them and view them from every angle. These ship models particularly fine, and the very large models of the Franconia and the Mauretania are very much at the heart of the collection. 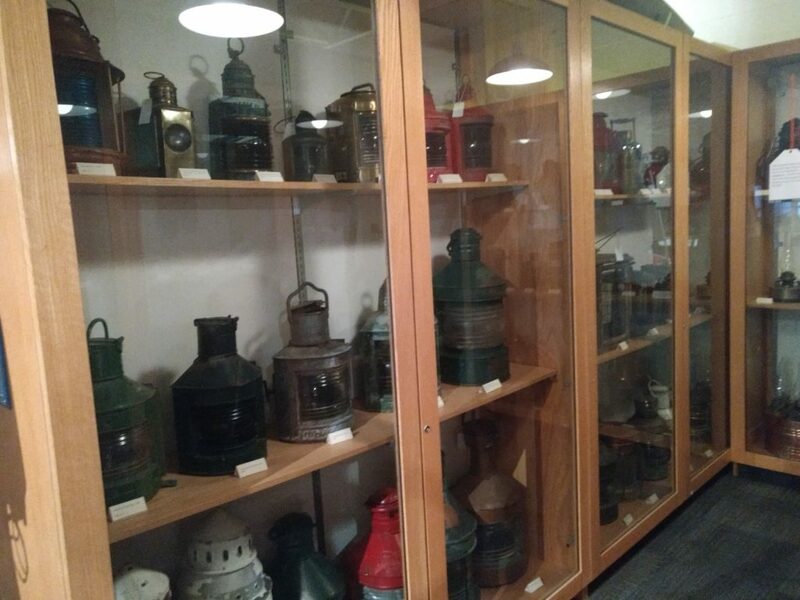 This collection displayed upstairs is very much geared towards steamships, from the early 19th century to the first decades of the 20th century. They are next to several moving models of steamship engines, so it is very much about steam and commerce. At the back of the upper floors are the Museum’s Visible Storage shelves. Rather more darkly lit than the rest of the displays on the upper floor, they are nonetheless an incredible opportunity for visitors to see much of the Museum’s collection that isn’t in use. Yet more ship models (of all various kinds of materials) material culture such as fresnel lenses, ship furniture and hardware, and a sizeable collection of hats and hat boxes. Given that in many other museums (such as the National Maritime Museum) keep a sizeable portion of the collection in non-public storage, it was nice to see the other items. However, it also clearly highlights the limits placed upon the Museum. The curators have staff have made a choice- what seems like fully half of the upper floor is dedicated to ship models (and there is a very large variety of them). I can understand why the models would get priority for display. For one thing, they’re certainly attractive- if not truly an attraction (I certainly didn’t know that the museum had such an extensive collection). I do wish though, that the objects in the Visible Storage section were displayed – with affection, is the term that comes to mind. It would be lovely if these objects could be displayed with more information about how they came into the Museum’s collections. There are some very, very lovely examples of maritime material culture, and even presenting a little bit more information about those items could create a lovely complex narrative about how the museum reflects maritime life- and what it misses. Further examples from the ‘Visible Storage’ section. The upper floor also contains galleries dedicated to Atlantic Coast shipwrecks, to the Ti tanic (including materials gathered by ships which departed from Halifax to try to rescue survivors), and to the Halifax explosion of 1917. Of these, I wish that the first could get more exposure. I feel like the message about the competing forces of archaeology and treasure hunters is certainly one that could use the concentrated of the museum behind it. 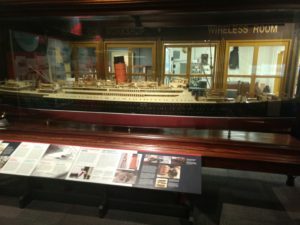 That it is effectively placed between the ship model galleries, and the artifact-centric galleries about the Titanic and the Halifax Explosion is either an excellent coincidence, or extremely well thought- out. I was very much impressed with the gallery about the Halifax Explosion, and very much moved by pieces of the Mont Blanc, distorted by the explosion. This is definitely worth viewing- and if you’re interested in that event of 1917, I very much suggest visiting the Naval Museum of Halifax at HMCS Stadacona, the main naval base in Halifax, where they opened a new gallery in 2017. 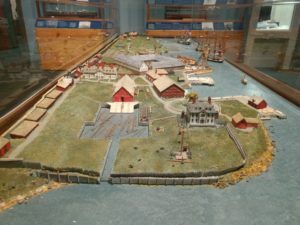 Diorama of Halifax Harbour during the age of sail. Moving back downstairs and towards the exit is the Museum’s naval gallery. This could have felt perfunctory, given the Museum at the base. And, perhaps, that term could be applied- but only if one was trying to be uncharitable. There are certainly some lovely artifacts- uniforms, objects, and plenty of ship models. Particularly interesting are the three models of ‘Tribal’ Class destroyers (of World War II, the 1970s era ‘Iroquois Class’ as originally built, and then of the post-TRUMP upgrade as they served until decommissioned in the 2010s. Given my connections to the Canadian Coast Guard, it’s not surprising that I am fond of the very large model of the icebreaker HMCS/CCGS Labrador. Another lovely display is the diorama of Halifax harbour during the age of sail, which is shown end-on to the left. This is a comprehensive gallery, and does an excellent job of covering all the high points. My one concern about the Museum is that, for lack of better term, it doesn’t address colonialism- well, throughout everything. Naturally, the vast majority of their exhibits deal with Halifax after the arrival of the British and the Royal Navy. So much of Halifax’s identity is wrapped up with the British, the Royal Navy, and colonial/imperial commercial connections. However, it is important to acknowledge how these assumptions erase substantial portions, and perspectives on Halifax and Nova Scotia’s maritime heritage. This is not a damning criticism by any means- this is an issues that the vast majority of public museums and institutions have to grapple with. It is also an extremely important one given that Governor Cornwallis’ legacy is now being publicly debated not just in Nova Scotia but indeed across the country. It would be interesting to see how the Museum would address these challenges. I think that in many ways the Maritime Museum of the Atlantic does a thorough, and good job, especially given the restraints placed on it by its location. I unfortunately was not able to visit it’s library on this visit, but I hope to do so in the future. 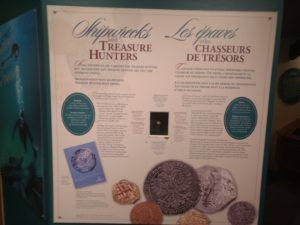 I do very much recommend that anybody who visits Halifax visit and enjoy these galleries and the lovely artifacts.